Tripping and Stumbling while following Jesus: "So this Idol worshipper goes to communion..."
The picture to the left is of Narcissus. If you know your ancient Greek mythology, then you know that this guy was so enamored with his good looks that at one point, when he saw his reflection in a pond, he stayed there and stared at it until he eventually turned into a flower. (If it helps, think of those Pretty Boy models for Abercrombie & Fitch.) 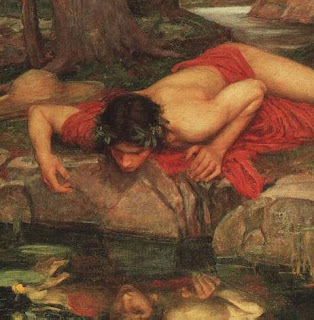 Narcissus worshipped himself. Simple as that. In the final of the three creation stories in Genesis, the fall of humanity comes about with one simple temptation. The serpent tells Eve that if she eats from the Tree of the Knowledge of Good & Evil that "You will be just like God." The original sin was not taking a bite out of whatever fruit was hanging from that tree. No. Sin entered the world when Eve thought something along the lines of; "Yeah. I want to be just like God." The moment she desired to be something she was not, and made a move for that fruit, BOOM, sin entered and it's been downhill from there. There is a group of musicians that I really like called The Newsboys. Most of the members are from Australia. So for a while they called themselves the Aussie Posse'. A couple of years back I heard a song of theirs titled "Rescue." I pretty much made that tune the theme song of my life. Everyday I am rescued again"
There is more to the song, but you should go out and buy it instead merely reading it here. I emphasize the final verse because it's something that I have come to understand more fully with every passing day. The grace of God really does surpass understanding. So why did I bring all that up? Well, something rather beautiful happened during the service at Living Waters this past morning. Please understand, there is a running joke that says that what ever happens during the service at Living Waters, wether what is preached, sung about, or said, NEVER happens by accident. Every single service seems to relate to what the other members have been dealing with during the previous week. Indeed, it happened again this morning. Pastor Scott took a back seat and let Bobby Hill run the show. (Yes, his name is the same as the cartoon character from the King of the Hill cartoon series.) It was to be a communion service, but it was decided to be run quite differently than your standard fare. There were a huge number of musicians on stage. Bobby told us that in between songs, if anyone thought they had a word from the Lord, or if they had an encouragement, a request, etc., that they could speak up and come forward. At the end, we were to serve each other the bread and the cup and just enjoy the fellowship. I usually do not get very involved in the whole singing portion. I dig on sermons. Still, I have noticed that I find myself getting more and more out of simply listening to the others singing. In fact, I whispered to a woman next to me that I ought to have known better and brought some tissues. You see, I am a Weeper. (Hey, I cried when Old Yeller was shot. How much more so when something of significance hits my heart?) So, by the second song I started to get that certain feeling again..."Where's a hanky when you need one." The second song was one called "My Soul Longs for You." It is an intentionally repetitive song and has always reminded me of the old tune by the 5th Dimension "The Age of Aquarius." "My soul longs for you. Nothing else will do. I believe that You will come like the rain. So let it rain." Now I have to tell you that our worship team is GOOD! Especially the ladies. And when everyone sings in harmony, it can be extremely powerful. My soul does long for God. As stuck as I am in a life that is far from perfect, I long to be close to God. Although I am never quite sure why God would long to be with me. But the Bible is very clear that God longs for a relationship with all of us. I doubt I'll ever figure out why that should ever be the case...at least in this life. Still, there I was with the beginning of becoming a human puddle. If this keeps up, folks are going to start scattering rice seeds around me. Eventually we got around to a song I hadn't heard before called "You Won't Relent." A few of the verses go like this, "You won't relent until you have it all. My heart is yours. Come be the fire inside of me, until you and I are one. My heart is yours." SO ANYWAY, it was at that point in the service that I could feel God pointing something out to me. In Paul's first letter to the church in Corinth he comes to a part where he begins to speak about celebrating the Lord's Supper. Paul wrote "Whoever eats the bread or drinks the cup of the Lord in an unworthy manner will be guilty of sinning against the body and blood of the Lord. A man ought to examine himself before he eats of the bread and drinks of the cup." Well, I was a feeling a bit on the unclean side that morning. There are a few issues that I struggle with. I have noticed that what might be a serious issue for me might not even hit the radar of someone else, and visa-versa. Still, for me these are serious issues that I feel hinder me from growing as close to Jesus as I would like. I felt God saying to me "Hey, now is a good time to confess this one publicly to to the rest of the body. They will be here for you!" I will confess that I was a bit scared. But I walked out of the service and out to my VUE. I grabbed something that I am ashamed of and came back to the service. I came up to Bobby and he let me address the rest of the body. I pulled out my tin of Grizzly chewing tobacco and told everyone that this is idol that I worship. For me, using tobacco IS a sin because I treat it as an idol. Part of me is addicted to it. However, another part of it is simple willfulness. I put its use before a healthy relationship with Jesus. For me, that is simply a fact. I worship it. Believe me, this has never been something that I was proud of. If I could reverse time, of all the stupid things I have done, this is the one that I wish I could undo the most. The root of all sin is in our desire to be God. We want to set the rules. We want to decide our own fate and be in charge. We do not wish to turn our lives over to God. Maybe a part of us does, but there is a nature at work deep inside all of us that resists. Even if you are a Believer, you still struggle with this old nature. The Bible says that you always will in this life. That little can of wasted money and potential mouth cancer has been the lynch pin idol for so many other issues that I wrestle with. I had to come clean about it. I didn't want to be a part of communion until I had made that clear. It was only a matter of moments before a sizable group had gathered to lay hands on me and pray. The little can of chew had been taken and put in a bowl. The juice we use to celebrate communion was poured over it to symbolize the blood of Jesus covering our sins. (Hey, I'm a Baptist. We use grape juice. Don't be judgin' now.) It felt good. After that was finished, we went on with the service. Torian led us in singing "Amazing Grace." Jeez, that guy can sing! The harmonies were much more powerful, sweet and vivid than I ever recall noticing before. It was pure. It was beautiful. I certainly was not the only person to get up and speak. I don't know if anyone talked with the others about what they had said after the service. I do know that a couple of people came up to me and said they were happy that I could make myself vulnerable. However, it wasn't my doing. The real compliment goes to the other members of the body, and of course to Christ. You see, I have gone to services at many places of worship with many, many other Believers. The body at Living Waters is the first group of Believers that I felt I actually COULD be open and vulnerable with. That is a compliment to them and the way that they have allowed God to work in their hearts and minds. But it is also a rather sad statement about much of the church in America. There is no such thing as a "Good Christian." Believers have no right what so ever to be stuffed shirts. If anything, we ought to be the most honest and bold people on the planet about our struggles. We all have them. Give a person a few minutes of your time and they just might pick up on a few of them. We might as well be honest and say "Yep, I can be quite a mess at times. Good thing Jesus loves me and will help me through all of it." Back in college, my friend Moy-Moy made this massive painting about the mask that we all wear. He points out that we ALL wear them from time to time. The irony is that we all know that we wear them, and that everyone else KNOWS that we wear them...and that they & we know that the they wear them too. Yet, it is so hard to simply remove them and throw them away. Why is that? Is it because we are all still trying to be something we are not...just like Eve did all those eons ago? Are we still trying to be God? Could be. I can't claim that this will be an easy fight for me. I know full well that there are times and situations that trigger my desire for a dip in the lip. It is very helpful to know that I have a group of people, members of the body of Christ, who might not fully understand my struggle, yet are there for me never the less. I will do my best to turn myself over to the power of Jesus so that he can help me to be there for them too. Actually, ever since that service it feels like a significant weight has been removed from my shoulders. Christ at work in the members of his body I do suppose. You know, I feel at this point that I have to apologize to any reader if they have ever been hurt by someone who called themselves a "Christian." If they judged you, or weren't there for you when you opened up and were vulnerable, I'm sorry. Believe me, I understand...I REALLY do. It is not supposed to be that way. I hope that you, that everyone, can find the type of Believers that I have found at Living Waters. It's a beautiful thing when the body really does allow Jesus to be the head. It demonstrates just how amazing grace can be. "I was born in the mess of it all. with a touch of your hand. Everyday I am rescued again." Seriously, why are you worried about writing again? Your passion (both for your chosen writing topic and getting your message out there) is unbelievable! You are putting me to shame (or inspiring me…can you do both at the same time?!) there are days I don’t want to think – and especially write – this in depth about anything. Your posts have definitely showed me what faith can be – in tough times and in not-so-tough times alike. Thanks, and keep writing it out (and down)! I am really happy for you! It takes incredible courage to allow oneself to be open and vulnerable in front of others, especially because we don't know how they will react... Will they treat us differently...? Or, can they accept us, right where we are, and love us anyway...? It is my hope for you, that you can know in your heart that you have people praying for you, all around you... So many people care about you! You are so worthy of that. God's love for you is perfect. He chose for you to be a part of this life - struggles and all, with the hope that you would choose to invite Him into your heart and into your life... You've done that with a passion! Your writing is awesome, and it will touch so many lives... It already has. Thank you!!! You know, Joe, I don't think you and I had every even introduced ourselves to each other at that point. I'm not sure I even knew your name. I was one of the musicians on stage that morning. During the time of sharing, our director told us to have a seat on the risers. Well, while sitting there, I kept getting this push from God.... go and pour the cup on that sin...show him that My blood covers ALL sin. I could feel the enemy saying "you can't pour grape juice on the school's stage!" God said, "find a bowl". I couldn't see a bowl anywhere and couldn't think where there might be one outside the sanctuary. Then I saw it.... the dome covering the grapes and bread. That was to be the bowl. Then Satan says to me, "if you go do that, the people will judge you. They're not going to see the symbolism. Don't be so stupid." I am so glad I listened to our Savior and that the symbolism wasn't misunderstood. Having read this 2+ years after it happened, I am so happy to know that God used me to impact you in the way that He intended.